From the start of Beast, Michael Pearce’s excellent feature debut, his protagonist Moll (Jessie Buckley) reads as a teen in arrested development—eventually we realize she’s a tigress living like a gazelle. Everyone preys on Moll’s perceived weakness by either pushing her around or simply ignoring her. Her mother, Hillary (Geraldine James), is both domineering and condescending toward her. Her older sister, Polly (Shannon Tarbet), takes Moll’s birthday party as an opportunity to announce she’s expecting twins. The ostensible lead in her own life, Moll is constantly outshone by her supporting cast. Rather than demand the respect she’s due, though, she meekly holds her peace. 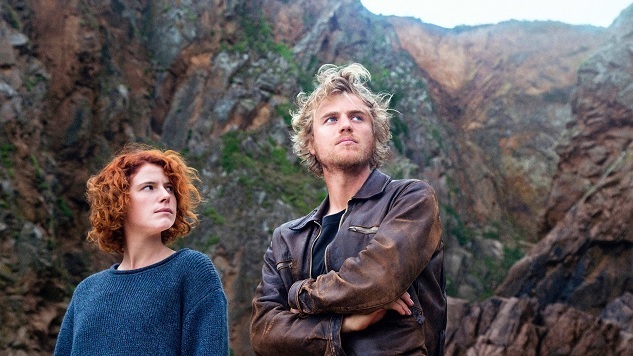 Then she meets Pascal (Johnny Flynn) and everything changes. Theirs isn’t a meet-cute. It’s more of a meet-brute, Pascal playing her scruffy knight in tarnished armor, rescuing her from a date veering rapidly into ugly territory in yet another example of the world taking advantage of Moll’s exterior innocence. One moment, Moll is getting harassed by a drunkard who believes he’s entitled to more than what she’s willing to give. The next, Pascal, emerging seemingly from nowhere, has a rifle leveled at the man’s face. Most women might find as much relief in this scenario as fresh terror. Moll is not most women. She finds Pascal intriguing, even enchanting, in his casual violence. Most of all she finds him a vital alternative to her family, friends and neighbors on the isle of Jersey, Pearce’s own home, an idyllic chunk of rocks and greenery between France and England. Pascal is an escape from social suffocation: He’s tough and doesn’t mince words, and yet to her he’s kind and soft spoken, invested in what she thinks and feels in ways no one else cares to be. He might also be a murderer. Beast is less Kirk Wise and Gary Trousdale, more Kalifornia. Jersey’s sunbathed rural charms belie the danger stalking its shores, a serial killer who has claimed three lives and possibly a fourth. Putting two and two together, Moll’s introduction to Pascal immediately puts him on the viewer’s shortlist of suspects. The question Beast puts to us is: Does Moll give a damn? Whatever Pascal is or isn’t, he pays attention to her, and when you’re a neglected young woman whose history of adolescent violence has kept her stuck in place like an insect trapped in amber, attention tends to do the trick: We are informed that, as a teenager, Moll stabbed a classmate with a pair of scissors in what she describes as self-defense, and it’s this memory that affects how she’s seen by Jersey’s inhabitants. But Pearce doesn’t invite us to play detective. The film’s outcomes are never framed, at least for the audience, in terms of morality. What Beast asks us is to consider whether or not there’s light to be found in darkness—and vice versa. Quite frankly, the murder mystery here is hardly a mystery at all, perhaps more of a foregone conclusion. However you perceive that mystery, there’s no denying Pearce cares little for it. The only mystery he’s interested in is Moll. Even Pascal’s enigmatic qualities resonate precisely because of the enigma. There’s never an attempt either from author or from actor to explain him or peel away his grimy, primal allure, apart from one aside in which he tells Moll’s family that he’s descended from Norman nobility and that, logically, they’re living on “his” land. It’s a great moment that manages to show us Pascal’s character and cement the mask he wears. More importantly, by denying us insight into the truth of Pascal, Beast apportions the overwhelming majority of its attentions to Moll. As Pascal, Flynn is quietly, unnervingly good, so much so that you may conclude that if he is the killer, you don’t mind as long as he remains loyal to Moll. Compared to Jersey’s other inhabitants, he’s a gem (though expectedly he has his worse merits, seen in the film’s third act). As Moll, Buckley is unbridled. The film hangs on her performance. Pearce has ceded the stage to her so she can explore Moll’s psychology and figure out exactly what it’s like to be the forgotten child. She’s the anti-Rory Gilmore: All of Jersey appears to know her, but rather than with affection they approach her with pity at best, caution at worst. We know she has troubles, and we know that she has paid for those troubles for the sake of others’ comfort. What we don’t really know is how her past has shaped her as an adult, and how the confluence of her history, her present, and her relationship with Pascal will influence her growth. Maybe for the better, maybe not. Maybe there’s a monster taking up real estate in her heart, a crueler self that’s lived in her since her school days. Or maybe depriving a person of compassion and validation for half their existence enforces rather than erases their darkness. Beast plays with enough restraint to sustain our doubts for most of its duration, its gentle and often lovely filmmaking lulling us toward false certainties about its underlying inhumanity. Then Buckley lets loose a scream of animalistic suppressed rage, shocking all within earshot, and we tumble back down to Beast’s somber reality.